How to write scene description files to render images with pbrt. Note: this document describes the scene description format for pbrt-v2, the version of the system that accompanies the second edition of the book. See the pbrt-v3 scene description documentation for the version of pbrt corresponding to the third edition. This document is a reference to the file format used in the pbrt; it serves as a comprehensive reference. The scene description files used by pbrt are plain text files. The file format was designed so that it would be both easy to parse and easy for applications to generate from their own internal representations of scenes. A pbrt scene file consists of a series of statements; different statements specify the geometry and light sources in the scene and set overall rendering parameters (such as which light transport algorithm to use or the image resolution). Each statement in these files corresponds directly to a pbrt API function from Appendix B in the Physically Based Rendering book. For example, when the WorldBegin statement appears in the input, the pbrtWorldBegin() function is called. To best understand this document, you should already be familiar with the concepts introduced in Appendix B, though we will try to re-introduce some key concepts from that appendix here. Here is a short example of a pbrt input file: Between the start of the file and the WorldBegin statement, overall options for rendering the scene are specified, including the camera type and position, the sampler definition, and information about the image to be generated. After WorldBegin, the lights, geometry, and scattering volumes (if any) in the scene are defined, up until the WorldEnd statement, which causes the image to be rendered. A scene description file starts with a series of directives that describe the camera, film, and sampling and light transport algorithms to use in rendering the scene. These are followed by the WorldBegin directive; after WorldBegin, the world definition block starts, and it is no longer legal to specify different definitions of any of the objects defined in the initial section of the file. However, lights, materials, textures, shapes, and volumetric scattering regions can be defined inside the world block (and can only be defined inside the world block). The world block ends with the WorldEnd directive; when this is encountered, the Renderer defined takes control and does the required rendering computation. The hash character # denotes that the rest of the line is a comment and should be ignored by the parser. The following section, Scene-wide rendering options, documents the directives that are valid outside of the world definition block. The subsequent section, Describing the scene, documents the directives for defining the shapes, materials, lights, etc., that define the scene. Here, the "type" string gives the name of the particular shape, etc., implementation to use, and parameter-list gives the parameters to pass to the plug-in. With this design, the parser doesn't need to know anything about the semantics of the parameters; it just needs to know how to parse parameter lists and how to initialize a ParamSet from them (The ParamSet class is described on page 1047 of the Physically Based Rendering book). Almost all directives in a pbrt input file have a direct correspondence with a function in the pbrt API, defined in the files core/api.h and core/api.cpp. The only input file directive that does not directly correspond to a function in the API is the Include statement, which allows other input files to be parsed. Include behaves similarly to the #include directive in C++, except that only the directory that the currently-being-processed input file is searched for matching filenames. Of course, a complete pathname or a path relative to the current directory can be specified if appropriate. specifies that "cropwindow" is a floating-point array with the given four values. Notice that values are enclosed in square brackets. Single values (such as the "30" in the "fov" example above) may be provided with or without square brackets enclosing them, though arrays of values always must be enclosed in square brackets. The type of each parameter must always be given along with its name; pbrt has no built-in knowledge of any parameter names. This simplifies the parsing system, although it does create a small burden for the creator of the input file. pbrt supports seven basic parameter types: integer, float, point, vector, normal, spectrum, bool, and string. The point, vector, and normal types all take three floating-point values to specify each value. string parameters must be inside quotation marks, and bool parameters are set with the strings "true" and "false", quotation marks included. specifies the RGB color with red equal to 0.2 and so forth. The FromRGB() method of the Spectrum implementation being used is used to convert the given RGB colors to the current spectral representation. Where the filename specifies the path to a plain text file with pairs of floating-point (wavelength, value) as above. The parser for these files allows uses # to denote a comment that goes to the end of the current line. See the directory scenes/spds in the pbrt distribution for examples. A series of directives modify the current transformation marix (CTM). (See Section B.2.2 on page 1053 for more information about how the CTM is maintined during scene description.) When the scene's camera is specified with a Camera directive, the CTM defines the world to camera transformation; when a light or shape is created, the CTM specifies the transformation from object space to world space. For example, Translate takes three floating-point values, x, y, and z, and the corresponding values are passed to the pbrtTranslate() API call, which in turn modifies the CTM by setting it to the product of the CTM with the matrix representing the given translation. This section describes rendering options that must be specified before the WorldBegin statement. When the Camera directive is encountered in an input file, the current transformation matrix is used to initialize the world-to-camera transformation. float shutteropen 0 The time at which the virtual camera shutter opens. float shutterclose 1 The time at which the virtual camera shutter closes. float frameaspectratio (see description) The aspect ratio of the film. By default, this is computed from the x and y resolutions of the film, but it can be overridden if desired. float screenwindow (see description) The bounds of the film plane in screen space. By default, this is [-1,1] along the shorter image axis and is set proportionally along the longer axis. The EnvironmentCamera takes no additional parameters beyond these. PerspectiveCamera and OrthoCamera support images rendered with depth of field. They both use the following two parmaeters to set the lens focus, etc. float lensradius 0 The radius of the lens. Used to render scenes with depth of field and focus effects. The default value yields a pinhole camera. float focaldistance 10^30 The focal distance of the lens. If "lensradius" is zero, this has no effect. Otherwise, it specifies the distance from the camera origin to the focal plane. Finally, the perspective camera has two (semi-redundant) parameters for setting the camera's field of view. float fov 90 Specifies the field of view for the perspective camera. This is the spread angle of the viewing frustum along the narrower of the image's width and height. float halffov n/a For convenience to some programs that export from modeling systems, the camera's field of view can also be specified via the half-angle between the view direction and the edge of the viewing frustum. If this parameter isn't provided, then fov is used to set the field of view instead. The Sampler generates samples for the image, time, lens, and Monte Carlo integration. A number of implementations are provided; the default is "lowdiscrepancy"—the LDSampler. Note that the sampler is only used if SamplerRenderer is the Renderer being used to render the scene; other renderers have their own sample generation mechanisms internally and/or don't need samples in this manner (e.g. AggregateTest). The HaltonSampler and StratifiedSampler are not as effective as the LDSampler, AdaptiveSampler, or BestCandidateSampler; the sample points they generate aren't as good and thus more samples will generally be required to get a similar result. The RandomSampler generates particularly ineffective sampling patterns. It is really only useful for comparison against more sophisticated approaches and shouldn't otherwise be used. The AdaptiveSampler takes a minimum number of samples in each pixel and then performs a test to see if, according to some metric, they vary excessively. If so, it takes a higher number of samples. The underlying sample generation algorithms are based on the low-discrepancy patterns used by the LDSampler. integer minsamples 4 This is the initial number of samples taken inside each pixel area. integer maxsamples 32 If the variation test indicates that this is a complex pixel area, then this number of samples is taken. string method contrast This parameter sets which test to use to see if a pixel is varying excessively. The two supported values are "contrast", which indicates that the color contrast between the sample values should be compared toa threshold, and "shapeid", which indicates that if different shapes are visible in the pixel area, additional samples should be taken. The "bestcandidate", "lowdiscrepancy", "halton", and "random" samplers all take a single parameter, "pixelsamples", which sets the number of samples to take in each pixel area. integer pixelsamples 4 The number of samples to take, per pixel. Note that the number of samples is taken per pixel on average; depending on the actual sampling algorithm being used, individual pixel areas may have slightly more or slightly fewer. The "stratified" sampler has three parameters that control its behavior. bool jitter "true" Whether or not the generated samples should be jittered inside each stratum; this is generally only worth setting to "false" for comparisons between jittered and uniform sampling—uniform sampling will almost always give a worse result. integer xsamples 2 The number of samples per pixel to take in the x direction. integer ysamples 2 The number of samples per pixel to take in the y direction. In general, "xsamples" and "ysamples" should be set to the same value for best results. The Film directive specifies the characteristics of the image being generated by the renderer. Note that only the SamplerRenderer and the MetropolisRenderer use the film; the other renderers don't generate an image per se and thus ignore the film definition. integer xresolution 640 The number of pixels in the x direction. integer yresolution 480 The number of pixels in the y direction. float cropwindow [ 0 1 0 1 ] The subregion of the image to render. The four values specified should be fractions in the range [0,1], and they represent x_min, x_max, y_min, and y_max, respectively. These values are in normalized device coordinates, with (0,0) in the upper-left corner of the image. string filename "pbrt.exr" The output filename. The ImageFilm uses the suffix of the given output filename to determine the image file format to use. All builds of pbrt support PFM and TGA format images; those configured to use the OpenEXR libraries support EXR as well. The implementation of ImageFilm uses an instance of the abstract Filter class to filter sample values to compute final pixel values. (Thus, as only the SamplerRenderer and the MetropolisRenderer use ImageFilm, the filter setting is only relevant when one of those renderers is being used. pbrt provides a number of filter implementations, listed below. The default is "box"; while the box filter has a number of known shortcomings, it is the most effective filter when the low-discrepancy sampler is being used (recall the illustration in Figure 7.37 on page 392 of Physically Based Rendering). All filter implementations take two parameters that set the filter width in each direction. Typically, these two parameters will have the same value. float xwidth 2 (0.5 for box, 4 for sinc) The width of the filter in the x direction. float ywidth 2 (0.5 for box, 4 for sinc) The width of the filter in the y direction. The "gaussian" filter takes an additional parameter that adjusts the rate of Gaussian falloff; see page 397 for more information. float alpha 2 alpha controls the falloff rate of the Gaussian filter. Smaller values give a blurrier image. Two parameters set the shape of the "mitchell" filter; see the equation on the top of page 400.
float C 1/3 These parameters control the shape of the Mitchell filter. The best results are generally obtained when B+2C=1. Finally the sinc filter takes a value tau that sets the number of cycles of the sinc function. float tau 3 tau controls how many cycles the sinc function passes through before it is clamped to zero by the windowing function. pbrt sometimes has a somewhat broad uage for "render the scene" in that some of the Renderer implementations don't actually generate images. The default renderer is "sampler", corresponding to the SamplerRenderer. The following Renderer implementations are currently available in pbrt. The "aggregatetest" renderer is one that doesn't create an image. Instead, it traces a number of random rays using the current acceleration structure (see Accelerators for information about how the accelerators are selected) and checks the results to the result from an exhaustive intersection of each ray with all of the triangles in the scene. This renderer can thus be used to find bugs in the implementation of accelerators; see Section 4.6 on page 245 for more information. integer niters 100000 Number of random rays to generate to use for testing the aggregate. float bounds (none) Bounding box (x0, y0, z0) - (x1, y1, z2) within which to compute radiance probes. If this is not specified, then the entire scene bounding box is used. bool directlighting true Determines whether direct illumination should be included in the computed incident radiance function. Some applications only include indirect radiance in the probes and use conventional techniques to render direct illumination. string filename "probes.out" Filename of file in which to store SH coefficients of radiance probes. bool indirectlighting true In a similar fashion, this parameter determines whether indirect illumination should be included in the radiance probes. integer lmax 4 Number of spherical harmonic bands to use to represent the incident radiance function. integer indirectsamples 512 Number of Monte Carlo samples to use to compute indirect illumination at each probe point. float samplespacing 1 Desired, in world space distance, between the radiance probes. The resolution of the grid of sample points is set so that the distance between samples is no greater than this distance along any of the x, y, or z axes. float time Time at which to sample the incident radiance to compute the probes. The "metropolis" renderer implements the Metropolis light transport algorithm; it is defined in Section 15.7 of the Physically Based Rendering book. float largestepprobability 0.25 Probability of the mutation strategy proposing a mutation where all of the sample values are replaced with completely new samples (versus a "small step" where the current sample values are only perturbed). In general, this value should be in the range 0.05 and 0.5. For scenes with particularly difficult-to-sample light transport paths, lower values may be more effective. integer directsamples 4 If direct lighting is being performed separately from Metropolis sampling, this gives the number of samples per pixel to take to compute the direct lighting component. bool dodirectseparately true Whether or not direct lighting should be included Metropolis sampling. For scenes where the direct lighting is handled well with conventional techniques, then it will often be more efficient to handle it separately, allowing the use of variance reduction approaches like low-discrepancy sampling patterns. For scenes with difficult-to-sample direct lighting, it's better to use Metropolis for this as well. integer maxconsecutiverejects 512 Maximum number of repeated rejections of a proposed sample mutation. If this many rejections occur in a row, the next sample is unconditionally accepted. This can prevent the system from getting stuck in a subset of the overall path space. integer maxdepth 7 Maximum number of light scattering bounces to follow when tracing paths through the scene. bool bidirectional true Indicates whether bidirectional path tracing should be used (versus standard path tracing.) It's almost always worthwhile to use bidirectional path tracing. The "sampler" renderer uses the defined Sampler to provide samples that it in turn uses to generate camera rays and then call the SurfaceIntegrator and VolumeIntegrator to compute the radiance along those rays. This is the default renderer in the system. In general, parameters that control its operation are set indirectly via parameters to the Sampler, SurfaceIntegrator, and VolumeIntegrator. bool visualizeobjectids "false" This renderer can optionally ignore the surface and volume integrators and randomly shade objects based on their shape and primitive id values. This can be useful to visualize the tessellation of complex objects and search for problems in geometric models. The "surfacepoints" renderer computes a set of sample points on the surfaces of objects in the scene that have BSSRDF materials (i.e. that exhibit subsurface scattering). These sample points are distributed on the surface according to a Poisson sphere criterion so that no two of them are too close together. Because the generation of these points can be computationally complex, it's often worth doing it in a preprocess; the DipoleSubsurfaceIntegrator can then read these files of sample points and use them at rendering time. float minsampledistance 0.25 Minimum distance allowed between any pair of sample points. string filename (none) Filename in which to save the generated points. An text file format is used; a comment at the start of the file describes its structure. A number of other surface integrators are available in the system. A greyscale ambient occlusion image is computed by the "ambientocclusion" integrator; it takes a number of samples over the hemisphere of each visible point and computes the fraction of them that are unoccluded. integer nsamples 2048 Number of samples to take in computing the ambient occlusion value. Lower values will be faster, but may lead to noisy images. float maxdist (infinite) Distance beyond which to ignore any intersections for the ambient occlusion computation. Often, considering only nearby occluders gives good results and can be much more efficient, as the rays to be traced are shorter. integer lmax 4 Maximum spherical harmonic band l to use; the total number of SH coefficients used at each point will be (lmax+1)*(lmax+1). integer nsamples 4096 Number of Monte Carlo samples to use when computing the projection of the transfer function T (Equation 17.20) into the spherical harmonics basis. The "dipolesubsurface" integrator implements the subsurface scattering rendering algorithm described in Section 16.5. It is otherwise similar to the direct lighting integrator, in that it follows specularly reflected and transmitted rays and uses standard algorithms to compute direct lighting. integer maxdepth 5 The maximum recursion depth for specular reflection and transmission. float minsampledistance 0.25 Minimum distance between the point samples generated on translucent objects at which to compute the incident irradiance. In general, this value should be around half of the mean free path of light inside the scattering medium. The value of this parameter is ignored if the "pointsfile" parameter is provided. string pointsfile (none) File from which to read precomputed sample points (as generated by the SurfacePointsRenderer, for example.) If a file is provided, the points to be used will be read from the file. Otherwise, the point generation step will be performed using the provided "minsampledistance" before rendering. There are two parameters for the "directlighting" integrator. integer maxdepth 5 The maximum recursion depth. string strategy "all" The strategy to use for sampling direct lighting. Valid options are "all", which samples all the lights uniformly and averages their contributions, and "one", which chooses a single light uniformly at random. The "glossyprt" integrator implements the glossy precomputed radiance transfer algorithm described in Section 17.5 of Physically Based Rendering. As with the "diffuseprt" integrator, it both computes the SH representation of scattering at each point and then computes the effect of this scattering with the light in the scene. In general, one would precompute the scattering properties and then compute the scattering in a real-time renderer. Furthermore, note that this integrator ignores the properties of the materials bound to objects in the scene but instead uses a simple parameterized material model for all scene objects. The reasons for this, and alternative approaches are discussed at the top of page 980.
integer lmax 4 Maximum SH band number l to use. Given a particular value of lmax, (lmax+1)*(lmax+1) SH coefficients will be used. integer nsamples 4096 Number of Monte Carlo samples to use in the various computations projecting quantities into SH. spectrum Kd 0.5 Diffuse reflectance spectrum of surfaces. spectrum Ks 0.25 Glossy reflectance of surfaces. float roughness 0.1 Surface roughness, for use with the Blinn microfacet distributions. The "instant global illumination" algorithm is implemented by the "igi" integrator. integer nlights 64 The number of virtual light paths to follow for each of the light sets. The more paths followed, the better the result in general, though the longer rendering takes. integer nsets 4 The number of independent virtual light sets to compute. In general, this number should be equal to the number of pixel samples taken by the sampler; this should ensure that in each pixel area, each of the light sets is used exactly one time. If this number is larger than the number of pixel samples, the image may be noisy, as different pixels will use different virtual lights. float rrthreshold 0.0001 Russian roulette threshold for terminating shadow rays that connect the point being shaded to a virtual light source. float glimit 10 Maximum allowed value of the geometric coupling term G; see Equations 15.11 through 15.12 on pages 782-783. If images have unexpected bright regions, reducing this value should cause them to disappear. integer gathersamples 16 Number of "final gather" samples to take at points where the G limit was applied. The irradiance caching integrator is used when the "irradiancecache" SurfaceIntegrator is specified. float minweight 0.5 Minimum weight for the interpolated irradiance samples. If the sum of interpolated sample weights is less than this value, a new sample is computed. float minpixelspacing 2.5 Minimum distance, in pixels, between irradiance samples. No samples nearer this distance will be generated. float maxpixelspacing 15 Maximum distance, in pixels, between irradiance samples. Even if the other error terms indicate that a sample can be used at a point being shaded, if it is more than this many pixels away on the image plane, it is ignored. float maxangledifference 10 Maximum allowed difference in the angle between the surface normal at an irradiance lookup point and the surface normal of an irradiance sample. integer maxspeculardepth 5 Maximum recursion depth for tracing specular reflection and refraction rays. integer maxindirectdepth 3 Maximum recursion depth for tracing paths to compute irradiance estimates. integer nsamples 4096 How many rays are used to estimate the irradiance value at a point. The "path" integrator takes just a single parameter. integer maxdepth 5 The maximum length of a path. Photon mapping is implemented by the "photonmap" integrator. integer causticphotons 20,000 The number of photons required to build the caustic photon map. The more caustic photons traced, the more accurately caustics will be represented in the scene, though the more memory will be required to store them. integer indirectphotons 100,000 The number of photons required to build the indirect illumination map. As with caustic photons, increasing the number of photons improves the result at the cost of more memory. integer nused 50 The number of photons to use in density estimation. integer maxspeculardepth 5 The maximum number of levels of specular reflection and refraction. integer maxphotondepth 5 The maximum number of levels of scattering to follow when tracing photon paths from light sources. float maxdist 0.1 The maximum distance between a point being shaded and a photon that can contribute to that point. integer finalgathersamples 32 Number of samples to use when performing the final gather. In general, a few thousand or so final gather samples are needed in each pixel area to give good results. However, it's the product of the number of pixel samples and the number of final gather samples that matters; for 32 or 64 pixel samples at each pixel, this default generlaly works well. float gatherangle 10 The photons around the point being shaded are used to construct an importance sampling distribution for final gathering by computing small cones around the incident direction of each one. (The notion being that these directions indicate the important directions for incident indirect illumination at the point.) This parameter sets the spread angle of these cones. Too narrow an angle may miss important indirect illumination directions, while too wide an angle may reduce the effectiveness of this small optimization. The "useprobes" integrator uses a set of radiance probes encoded in spherical harmonics, such as those computed by the CreateRadianceProbes renderer. At each point being shaded, it computes the diffuse reflectance and then uses the SH convolution formula to compute the outgoing scattered radiance due to the incident illumination in the scene. pbrt provides two volume integrators; the default is EmissionIntegrator, which only accounts for volumetric attenuation and emission. The SingleScatteringIntegrator computes the effect of single scattering and can thus render volumetric shadows, though it can be substantially more computationally intensive. Both volume integrators take a single parameter, which specifies the distance in world space along the ray to go forward at each step. In general, smaller values will cause rendering to take longer, but will better resolve fine-scale details in the volume description. float stepsize 1 The stepping distance along a ray when doing ray marching. The default accelerator, "bvh", is generally a good choice; it is rarely worthwhile to specify a different accelerator or to need to change the accelerator's parameters to improve performance. The "bvh" accelerator, the default, takes just two parameters. This accelerator is efficiently constructed when the scene description is processed, while still providing highly efficient ray-shape intersection tests. integer maxnodeprims 4 Maximum number of primitives to allow in a node in the tree. Once the primitives have been split to groups of this size or smaller, a leaf node is created. string splitmethod "sah" Method to use to partition the primitives when building the tree. The default, "sah", denotes the surface area heuristic; the default should almost certainly be used. The other options—"middle", which splits each node at its midpoint along the split axis, or "equal", which splits the current group of primitives into two equal-sized sets—are slightly more efficient to evaluate at tree construction time, but lead to substantially lower-quality hierarchies. The "grid" accelerator takes only a single parameter. While this accelerator is extremely efficient to create, it is substantially lower performance than the others at ray-shape intersection time. bool refineimmediately false If true, primitives are fully refined as soon as they are added to the grid. Otherwise, they are not refined until a ray enters a voxel that contains the primitive. Finally, the "kdtree" accelerator takes a number of parameters that control its construction. This accelerator takes substantially longer to create than "bvh" at scene definition time, but it can be marginally faster at finding ray-shape intersections. It tends to require less memory than "bvh". integer intersectcost 80 The value of the cost function that estimates the expected cost of performing a ray-object intersection, for use in building the kd-tree. integer traversalcost 1 Estimated cost for traversing a ray through a kd-tree node. float emptybonus 0.2 "Bonus" factor for kd-tree nodes that represent empty space. integer maxdepth -1 Maximum depth of the kd-tree. If negative, the kd-tree chooses a maximum depth based on the number of primitives to be stored in it. After the camera, film, and rendering options have been set, the WorldBegin directive marks the start of the scene definition (the "world block"). In the world block, the lights, materials, and geometric shapes that make up the scene are defined. After WorldBegin, the directives described in the Scene-wide rendering options section are all illegal; an error message will be printed if one is encountered. (Similarly, the directives documented in this section are illegal outside of the world block.) The end of the world block is denoted by the WorldEnd directive; when it is encountered, the chosen Renderer takes over and does the requested rendering computation. The transformation matrix can be saved and restored independently of the graphics state using TransformBegin and TransformEnd. In addition to the current transformation matrix and material, the reverse-orientation setting, specified by the ReverseOrientation directive, is part of the graphics state. This directive, when active, flips the surface normal of the shapes that follow it; it can be useful when specifying area light sources, which only emit light from the side their surface normal points from, and when specifying transparent materials, where the surface normal is used to determine whether rays are entering or exiting the refractive medium. When a Shape directive is encountered, the current transformation matrix is used to set the object to world transformation for the shape. A number of shapes are provided by pbrt; this list shows the mapping from shape names to implementation class in the system. The extent of the "cone" shape is defined by three parameters; note that the cone is oriented along the z axis in object space; the current transformation matrix can be used to orient it differently in the scene's world space. float radius 1 The cone's radius. float height 1 The height of the cone along the z axis. float phimax 360 The maximum extent of the cone in phi (in spherical coordinates). Similarly, "cylinder" is oriented along the z axis as well. It takes four parameters. float radius 1 The cylinder's radius. float zmin -1 The height of the cylinder's bottom along the z axis. float zmax 1 The height of the cylinder's top along the z axis. float phimax 360 The maximum extent of the cylinder in phi (in spherical coordinates). The "disk" is perpendicular to the z axis, with its center at x=0 and y=0. float height 0 The location of the disk along the z axis. float radius 1 The outer radius of the disk. float innerradius 0 The inner radius of the disk (if nonzero, the disk is an annulus). float phimax 360 The maximum extent of the disk in phi (in spherical coordinates). The "heightfield" shape isn't described in the pbrt book text; it's essentially a compact way to describe a regular triangulated mesh. The user provides resolutions in the u and v directions and then a series of height values. The height values give the z values for a series of vertices over [0,1]^2 in (x,y). int nu, nv none Number of sample values in each direction. The total number of triangles in the mesh is 2 * (nu-1) * (nv-1). float[nu*nv] Pz none Array of height values to specify the hieightfield. "hyperboloid" takes two points to define the line of revolution that sweeps out its surface. point p1 0 0 0 The first end point of the hyperboloid's line of revolution. point p2 1 1 1 The second end point of the hyperboloid's line of revolution. float phimax 360 The maximum extent of the hyperboloid in phi (in spherical coordinates). The "loopsubdiv" shape corresponds to a subdivision surface evaluated with Loop's subdivision rules. integer nlevels 3 The number of levels of refinement to compute in the subdivision algorithm. integer[n] indices required—no default Indices for the base mesh. Indexing is the same as for the triangle mesh primitive. (See "trianglemesh" below). point[n] P required—no default Vertex positions for the base mesh. This is the same as for the triangle mesh primitive. (See "trianglemesh" below). "nurbs" can be used to define a NURBS surface. The current implementation does a fixed-rate tessellation, with tesselation rate provided directly by the user. integer nu, nv none—must be specified Number of control points for NURBS patch in the u and v parametric directions. float[nu+uorder] uknots none—must be specified Knot vector for NURBS in the u direction. float[nv+vorder] vknots none—must be specified Knot vector for NURBS in the v direction. float u0, v0 none—must be specified Starting u and v parametric coordinates at which to evaluate NURBS. float u1, v1 none—must be specified Ending u and v parametric coordinates at which to evaluate NURBS. point[nu*nv] P none Either the P or Pw parameter must be specified to give the surface's control points. P gives regular control points. float[4*nu*nv] Pw none Specifies rational control points, with an additional per-vertex weight value. Here are the parameters for "paraboloid". float radius 1 The paraboloid's radius. float zmin 0 The height of the lower clipping plane along the z axis. float zmax 1 The height of the upper clipping plane along the z axis. float phimax 360 The maximum extent of the paraboloid along phi (in spherical coordinates). And these are the "sphere" parameters. float radius 1 The sphere's radius. float zmin -radius The height of the lower clipping plane along the z axis. float zmax radius The height of the upper clipping plane along the z axis. float phimax 360 The maximum extent of the sphere in phi (in spherical coordinates). An arbitrary triangle mesh is defined by the "trianglemesh" shape. The mesh's topology is defined by the indices parameter, which is an array of integer indices into the vertex arrays. Each successive triplet of indices defines the offsets to the three vertices of one triangle; thus, the length of the indices array must be a multiple of three. Here, we have an array of four vertices in the P parameter. The indices array defines two triangles that use these vertices—the first one has vertex positions (550,0,0), (0,0,560), and (0,0,0). Note that both triangles use vertices 0 and 2. Because the triangle mesh is specified in a way that makes this vertex reuse explicit, the in-memory representation of the triangle mesh can be more compact than if each triange had to explicitly and privately store all of its per-vertex data. point[n] P required—no default The vertex positions of the triangle mesh. normal[n] N none—optional Per-vertex normals. If present, shading normals will be computed from these values. vector[n] S none—optional Per-vertex tangents. float[2*n] uv none—optional Per-vertex texture coordinates. float texture alpha none Optional "alpha" texture. (See the Textures section for more information about textures in pbrt.) When provided, at any point on the triangle where the alpha texture evaluates to have the value zero, the triangle is cut away and any ray intersection is ignored. If a complex object is used repeatedly in a scene, object instancing may be desirable; this lets the system store a single instance of the object in memory and just record multiple transformations to place it in the scene. Object instances are created via named objects. When a named object is defined, the current transformation matrix defines the transformation from object space to the instance's coordinate space. After a named object has been defined, it can be instantiated with the ObjectInstance directive. The current transformation matrix then defines the instance space to world space transformation; thus, the final transformation for a shape in an object instance definition is the composition of the CTM when the instance was defiend and the CTM when the instance was instantiated. Light sources cast illumination in the scene. pbrt provides two types of lights: lights that exist in the scene without any geometry associated with them, and lights that describe emission from one or more shapes in the scene (area lights). The first type of light is defined with the LightSource directive. There are 6 light sources of this type that are currently available in pbrt. When a light source definition is encountered, the current transformation matrix is used to define the light-to-world transformation. Many of the light sources also take parameters to place it in the scene; using either a transformation matrix or an explicit position or direction to place a light can be useful. All lights support a spectrum "scale" parameter that scales the amount of light that the light emits. spectrum scale rgb (1 1 1) Scale factor that modulates the amount of light that the light source emits into the scene. spectrum L rgb (1 1 1) The radiance emitted from the light source. point from (0,0,0) "from" and "to" define the direction vector along which illumination from the light arrives at the scene. The defaults give a light that shines along the z axis. The "goniometric" light represents a point light source with directionally-varying emission, where the emission distribution is represented by a texture map. This representation can be useful for modeling many real-world light sources, where measurements of this distribution may be available. spectrum I rgb (1 1 1) A radiant intensity scale-factor; the radiant intensity in a particular direction is computed as the product of this value and the appropriate value from the goniometric diagram table. string mapname required—no default The filename of the image file that stores a goniometric diagram to use for the lighting distribution. spectrum L rgb (1 1 1) A radiance scale factor for the light; final emitted radiance values for a particular direction are computed as the product of this value and the radiance value found from the environment map. integer nsamples 1 Suggested number of shadow samples to take when computing illumination from the light. Depending on the number of pixel samples being taken, this value may need to be increased to reduce noise in the illumination computation for the light. string mapname none The environment map to use for the infinite area light. If this is not provided, the light will be a solid color. spectrum I rgb (1 1 1) The light's emitted radiant intensity. point from 0 0 0 The location of the light. The "projection" light acts like a slide projector; the given image is used to define a 2D emission distribution that is projected with a center of projection at the light's position. Directions outside the frustum of light projection receive no emitted illumination. spectrum I rgb (1 1 1) Radiant intensity scale factor; the intensity in a given direction is the product of this value and the value from the image map for the corresponding direction. float fov 45 The spread angle of the projected light, along the shorter image axis. string mapname required—no default The image to project into the scene. A spotlight is defined by the "spot" light source. The spotlight is defined by a lighting direction and then two angles that specify a cone of directions in which light is emitted. spectrum I rgb (1 1 1) Maximum radiant intensity of the light; this is the emitted radiant intensity in the center of the illumination cone. It falls off to zero outside of the cone. point from, to see description Two points defining the lighting vector. The defaults are (0,0,0) and (0,0,1), respectively. This gives a light that is pointing down the z axis. float coneangle 30 The angle that the spotlight's cone makes with its primary axis. For directions up to this angle from the main axis, the full radiant intensity given by "I" is emitted. After this angle and up to "coneangle" + "conedeltaangle", illumination falls off until it is zero. float conedeltaangle 5 The angle at which the spotlight intensity begins to fall off at the edges. Area lights have geometry associated with them; the shape and size of the emitting shapes have a substantial effect on the resulting emitted radiance distribution. After an AreaLightSource directive, all subsequent shapes emit light from their surfaces according to the distribution defined by the given area light implementation. The current area light is saved and restored inside attribute blocks; typically area light definitions are inside an AttributeBegin/AttributeEnd pair in order to control the shapes that they are applied to. pbrt currently only includes a single area light implementation, "diffuse". The "diffuse" area light takes just two parameters. spectrum L rgb (1 1 1) The amount of emitted radiance at each point and emitted direction..
Parameters to materials are distinctive in that textures can be used to specify spatially-varying values for the parameters. For example, the above material definition defines diffuse surface with the same reddish color at all points. Alternatively, we might want to use an image map to define the color as a function of (u,v) on the surface. This is done by defining a texture with a user-defined name (below, "lines-tex"), and then binding that to the desired parameter of the material. For example, the following sets the "Kd" parameter of the "matte" material to be computed via lookups to the "lines.exr" image map. Texture "lines-tex" "spectrum" "imagemap" "string filename" "textures/lines.exr"
Material "matte" "texture Kd" "lines-tex"
Finally, it is sometimes useful to name a material. A named material is a material and a set of parameter bindings (to constant values or to textures). It is defined with the MakeNamedMaterial directive. A named material can be set to be the current material with the NamedMaterial directive. Material "matte"  # current material is "matte"
This table lists the materials available in pbrt and the corresponding class in the source code distribution that implements each of them. All of the above materials take a texture that can be used to specify a bump map. float texture bumpmap None The floating-point texture to be used as a bump map. spectrum texture Kr 1 The reflectivity of the surface. spectrum texture Kt 1 The transmissivity of the surface. spectrum texture Kd 0.5 Diffuse scattering coefficient used to derive scattering properties. float texture meanfreepath 1 Average distance light travels in the medium before scattering. float texture index 1.3 The index of refraction inside the object. spectrum texture Kr 1 Specular reflection term; this coefficient is modulated with the dielectric Fresnel equation to give the amount of specular reflection. The "matte" material defines an object with simple Lambertian scattering. It takes two parameters. spectrum texture Kd 0.5 The diffuse reflectivity of the surface. float texture sigma 0 The sigma parameter for the Oren-Nayar model, in degrees. If this is zero, the surface exhibits pure Lambertian reflection. string filename none Name of file with measured reflection data to be loaded. The "metal" material describes scattering from metals, where the index of refraction (eta) and the absorption coefficient (k) describe metals' reflectance spectra. These and a roughness parameter, which adjusts the microfacet distributions roughness, describe the overall material. See the scenes/spds/metals directory in the pbrt distribution for spectra of the IOR and absorption coefficients of a variety of metals. spectrum texture eta (copper) Index of refraction to use in computing the material's reflectance. spectrum texture k (copper) Absorption coefficient to use in computing the material's reflectance. float texture roughness 0.01 Roughness of the material's microfacet distribution. 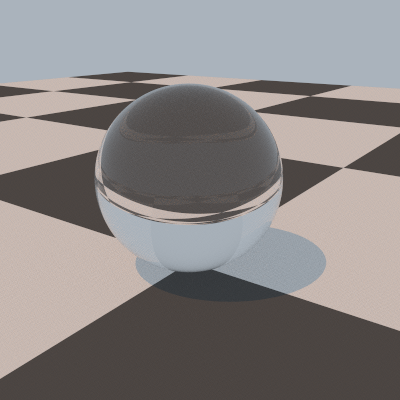 Smaller values become increasingly close to perfect specular reflection. This value should be between zero and one. The "mirror" material is a simple specular reflector. The amount of reflection isn't modified by the Fresnel equations. spectrum texture Kr 0.9 The reflectivity of the mirror. This value can be used to make colored or dim reflections. The "mix" material interpolates between two previously-named materials using a texture. This allows spatially-varying variation between two materials. spectrum texture amount 0.5 Weighting factor for the blend between materials. A value of zero corresponds to just "namedmaterial1", a value of one corredponds to just "namedmaterial2", and values in between interpolate linearly. string namedmaterial1 (none) Name of first material to be interpolated between. string namedmaterial2 (none) Name of second material to be interpolated between. "plastic" defines a simple plastic material, described by diffuse and specular reflection coefficients as well as a roughness value that describes how much variation there is in the microfacet distribution that models glossy specular reflection. spectrum texture Kd 0.25 The diffuse reflectivity of the surface. spectrum texture Ks 0.25 The specular reflectivity of the surface. float texture roughness 0.1 The roughness of the surface, from 0 to 1. Larger values result in larger, more blurry highlights. The "shinymetal" material is only present for backwards compatibility with scenes from pbrt-v1. It shouldn't be used for any new scenes; the new "metal" material provides a much more accurate model of reflection from metals. float texture roughness 0.1 The roughness of the surface. spectrum texture Ks 1 The coefficient of glossy reflection. spectrum texture Kr 1 The coefficient of specular reflection. The "substrate" material mixes between diffuse and glossy reflection based on the viewing angle—this models many realistic materials, which become increasingly specular as the viewing angle approaches grazing. It also supports anisotropic microfacet models, with two roughness parameters. spectrum texture Kd 0.5 The coefficient of diffuse reflection. spectrum texture Ks 0.5 The coefficient of specular reflection. float texture uroughness 0.1 The roughness of the surface in the u direction. float texture vroughness 0.1 The roughness of the surface in the v direction. The "subsurface" material is another material that describes subsurface scattering. It allows directly setting the absorption coefficient and reduced scattering coefficient. (These values are generally difficult to set manually to achieve a desired look; the "kdsubsurface" material is usually better for that. However, if measured data is available, this material is the appropriate one.) This material also supports setting the scattering properties using values that have been measured by various researchers. string name none Name of measured subsurface scattering coefficients. See the file src/core/volume.cpp in the pbrt distribution for all of the measurements that are available. spectrum texture sigma_a (.0011, .0024, .014) Absorption coefficient of the volume, measured in mm^-1. spectrum texture sigma_prime_s (2.55, 3.12, 3.77) Reduced scattering coefficient of the volume, measured in mm^-1. float scale 1 Scale factor that is applied to sigma_a and sigma_prime_s. This is particularly useful when the scene is not measured in mm and the coefficients need to be scaled accordingly. For example, if the scene is modeled in meters, then a scale factor of 0.001 would be appropriate. float texture index 1.3 Index of refraction of the scattering volume. The "translucent" material models transmission through thin objects (like leaves). spectrum texture Kd 0.25 The coefficient of diffuse reflection and transmission. spectrum texture Ks 0.25 The coefficient of specular reflection and transmission. spectrum texture reflect 0.5 Fraction of light reflected. spectrum texture transmit 0.5 Fraction of light transmitted. float texture roughness 0.1 The roughness of the surface. (This value should be between 0 and 1). Finally, the "uber" material is a "kitchen sink" material that supports diffuse, glossy specular, and specular reflection. spectrum texture Kd 0.25 The coefficient of diffuse reflection. spectrum texture Ks 0.25 The coefficient of glossy reflection. spectrum texture Kr 0 The coefficient of specular reflection. float texture index 1.5 Index of refraction of the surface. This value is used in both the microfacet model for specular reflection as well as for computing a Fresnel reflection term for perfect specular reflection. spectrum texture opacity 1 The opacity of the surface. Note that when less than one, the uber material transmits light without refracting it. Texture "mydiffuse" "spectrum" "imagemap" "string filename" "image.tga"
Material "matte" "texture Kd" "mydiffuse"
The Texture statement creates a named texture of a particular type. Currently, the only types that are supported are spectrum (color can be used a synonym for this) and float. In the below, note that a number of textures (e.g. "mix") themselves take textures as parameters; thus, one can build up small "trees" of computation to compose a series of texture functions. Textures can be separated into three categories: any-D, 2D, and 3D. Any-D textures are ConstantTexture, ScaleTexture, and MixTexture. These kinds of textures do not have a specific dimensionality and have no common arguments. string mapping "uv" A string specifying the kind of texture coordinate mapping to use. Legal values are: "uv", "spherical", "cylindrical", or "planar". float uscale, vscale 1 Scaling factors to be applied to the u and v texture coordinates, respectively. These parameters are only meaningful if the texture coordinate mapping type has been set to "uv". float udelta, vdelta 0 An offset to be applied to the u and v texture coordinates, respectively. These parameters are only meaningful if the texture coordinate mapping type has been set to "uv" or "planar". vector v1, v2 see description v1 and v2 are two vectors that define a planar mapping. The defaults are (1,0,0) and (0,1,0), respectively. These parameters are only meaningful if the texture coordinate mapping type has been set to "planar". 3D textures use a texture space point location to evaluate themselves. The current transformation matrix at the time they are created gives the transformation from object space. They are CheckerboardTexture, FBmTexture, WrinkledTexture, MarbleTexture, and WindyTexture. Note that CheckerboardTexture is the only texture that can be either a 2D or 3D texture (see its plug-in specific parameter settings in the following). 3D textures have no common parameters. Most of the provided textures can generate either Spectrum or float values, which is why many of the following descriptions have the spectrum/float type. The "constant" texture is just a convenience that always returns a given constant value. spectrum/float texture value 1 The constant value of this texture. "scale" takes two textures as parameters, evaluates each of them, and returns their product. It is often convenient to scale a texture used as a bump map by a constant float value to modulate the perceived height of the bumps, for example. spectrum/float texture tex1, tex2 1 These two textures will be multiplied together by the ScaleTexture. "mix" takes two textures and lienarly interpolates between their values according to the "amount" parameter (which may itself be a texture). spectrum/float texture tex1 0 One of the two textures to be mixed. spectrum/float texture tex2 1 The other texture to be mixed. These two textures must be of the same type. float texture amount 0.5 The amount to use when linearly interpolating between the two mix textures. "bilerp" bilinearly interpolates between the four textures using the (u,v) parametric coordinate. The v00 parameter represents the texture to use at (0,0), and so forth. spectrum/float texture v00, v01, v10, v11 see description The four values to be bilinearly interpolated between. They default to 0, 1, 0, and 1, respectively. Image maps can be provided with the "imagemap" texture. string filename required—no default The filename of the image to load. Currently pbrt supports TGA, PFM, and EXR format images. string wrap "repeat" What to do with texture coordinates that fall outside the legal [0,1] range. Legal values are "repeat", which simply tiles the texture; "black", which returns black when outside the legal range; and "clamp", which always returns the nearest border texel. float maxanisotropy 8 The maximum elliptical eccentricity for the EWA algorithm. bool trilinear false If true, perform trilinear interpolation when looking up pixel values. Otherwise, pbrt uses the EWA algorithm for texture filtering. EWA gives much better results, but is slower. float scale 1 Scale factor to apply to value looked up in texture. float gamma 1 "Gamma" value for optional gamma correction to looked-up values. This is useful for textures that aren't encoded in a linear color space. The "checkerboard" texture is a simple texture that alternates between two other textures. integer dimension 2 Sets the dimension of the checkerboard texture. Legal values are 2 and 3.
spectrum/float texture tex1 1 The texture to use for even checks. spectrum/float texture tex2 0 The texture to use for odd checks. string aamode "closedform" Set the antialiasing mode for the checkerboard texture. Legal values are "closedform" or "none". This parameter is only legal for 2D checkerboards. The "dots" texture generates a random collection of polka dots. spectrum/float texture inside, outside see description The textures to use for coloring the dots and the background. The defaults are 1 and 0, respectively. "fbm" and "wrinkled" are two textures based on the Perlin noise function. They are 3D textures, so the scale of the features of the texture can be adjusted by setting accordingly the CTM when the texture is defined. integer octaves 8 The maximum number of octaves of noise to use in spectral synthesis. float roughness 0.5 The "bumpiness" of the resulting texture. Finally, "marble" is a simple approximation to a layered marble texture, based on using Perlin noise to create stochastic variation in the result. float scale 1 A scaling factor to apply to the noise function inputs. float variation 0.2 A scaling factor to apply to the noise function output. Finally, there are three scattering volume implementations available for specifying spatially-varying scattering volumes to model objects like smoke and clouds or atmospheric scattering. spectrum sigma_a 0 The absorption cross section. spectrum sigma_s 0 The scattering cross section. float g 0 The phase function asymmetry parameter. spectrum Le 0 The volume's emission spectrum. point p0 0 0 0 One corner of the volume's bounding box. point p1 1 1 1 The other corner of the volume's bounding box. The "exponential" volume decreases the density of the volume as a function of height. See the discussion of its implementation on page 594 of the second edition of "Physically Based Rendering". float a,b 1 The parameters in the exponential volume' a e^(-bh) formula. vector updir (0,1,0) The "up" direction along which to compute height. And the "volumegrid" allows specification of a sampled volume density on a regular grid. Final scattering properties at points inside the volume are computed by trilinearly interpolating the adjacent sample values and then scaling the sigma_a, sigma_s, etc., parameter values by the result. integer nx,ny,nz 1 The number of voxels in the x, y, and z directions, respectively. float[nx*ny*nz] density 0 The array of density values.